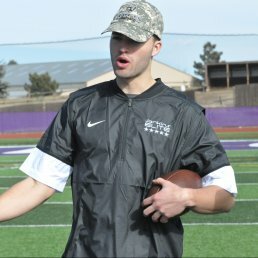 Coach Snyder started with Jenkins Elite in 2017 as a QB coach. Now in the role of Sales Director & QB Coach, Alex reviews film and applications of all athletes hoping to be accepted into the Jenkins Elite Program. 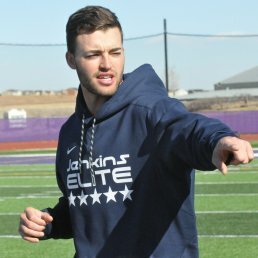 Since joining Jenkins Elite in 2017 Coach Alex Snyder has mentored and helped with the training of every Quarterback that trains with Jenkins Elite. Alex trains Quarterbacks from 2nd – 12 grade as well as NCAA QB’s. Alex Snyder was contacted by the Tampa Bay Buccaneers on the third day of the 2017 NFL Draft. He was invited to participate in their 2017 Rookie Mini-Camp. Alex Snyder was a 4-year starting Quarterback at Tufts University. He finished his career near the top of every school passing record. After graduating Tufts in 3 years with a degree in Entrepreneurial Leadership Studies, Alex was invited to the Regional Combine in Seattle, Washington in February of 2017. Following that he secured a Pro-Day invite at Colorado State University-Pueblo in March of 2017. After impressing scouts at his Pro-Day, Alex landed on the radar of NFL Teams. Alex Snyder was a 3-sport athlete throughout his high school career. As a Pitcher in Baseball, he was invited to participate in Area Code, where he drew interest from scouts at the University of North Carolina at Chapel Hill as well as the University of Nebraska. Throughout his senior football season, Alex drew interest from Colorado State, Louisiana Tech, Columbia, Dartmouth, Princeton, and Cornell. Alex ultimately decided to commit to Tufts University and help turn around one of the longest losing streaks in the NCAA. We are currently taking on applications at Jenkins Elite. Based on the program you are interested in you may be able to join right away or encounter a waiting list. Thanks for your interest in our program.